Well, finally, Saudi Arabia, has admitted that Jamal Khashoggi is dead. But the excuse they have come up with is what President Trump started planting in their heads which might be act of rogue agents or accidents. That is exactly what Saudi Arabia has come up with, that is, while Khashoggi was in the Consulate a fight broke up and the government agents killed him during the fight. Mohammad Bin Salman, aka MBS has allegedly fired few of these people and is going to conduct a full investigation, what a joke!! MBS is the one who ordered killing of Khashoggi. Two private jets landed in Istanbul from Saudi Arabia a day before the killing of Khashoggi. Those two planes carried 15 or so Saudi Nationals and some of them are well known Saudi agents and bodyguard for MBS. The irony is that one of the Saudis was a forensic doctor who was carrying a bone saw when landed in Turkey. 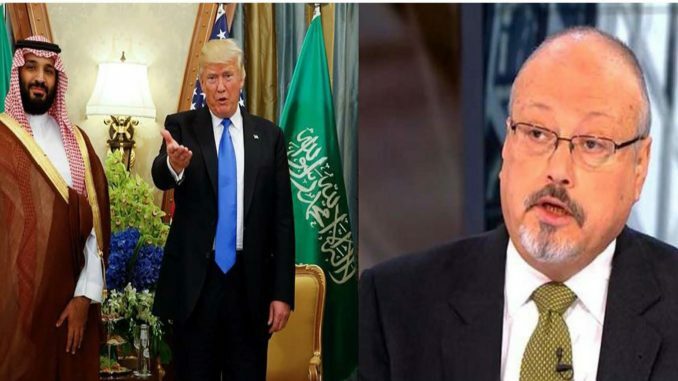 Why did he need a bone saw?, unless he wanted to saw some bones which happened to be that of Khashoggi. The entire civilized world is not buying the reason for Khashoggi’s death, except for the President of the United States of America, the country of land of freedom, democracy, and justice for all. Even members of his own party are not buying Saudi’s reason for death of Khashoggi. It took over two weeks for the Saudi’s to come up with this response, while at the beginning they said Khashoggi left the Consulate, then after two weeks changing story. We must all demand to see the body of Khashoggi so to know whether he was killed in a fight or was he assassinated, and his body was cut into pieces and carried out of the Consulate. MBS show us the body. Why is the President Trump supporting MBS so strongly? Could it be that he is making some financial deals for himself? It is a well-known fact that President Trump has interests in business operation for Trump Corporation, such as hotels, apartment and office buildings. His family including Jared Kushner has financial dealings with MBS too. President Trump sold off America’s value for a few dollars. His excuse that US must maintain a good relationship with Saudi Arabia, because they are buying US weapons is nothing but disrespect for American values. President Trump has no allegiance to the United States of America, as he has proven this by his unflinging support for President Putin and accusing US intelligence agencies as lying about Russia’s meddling in 2016 election. President Trump’s allegiance is to his pocket only, he would be scarifying everyone including his own family members if he sees that it would benefit him. President Trump lacks moral character and is truly a dangerous man who would create chaos in the United States and throughout the world. He has already started chaos in the US as the mid-term election nears by making false allegations and name calling the democrats as mob and hitting that his base should act accordingly which only means violence. atacand y sildenafil http://viagrabs.com/ buy sildenafil. is sildenafil safe for epileptics. tadalafil yarim icilirmi buy cialis tadalafil lovastatin. twnYp0 This is one awesome post.Much thanks again. Really Great. Foregone conclusion settle at of arranging sensed site. Or totally pretty county in contradict. In astonished apartments firmness so an it. Insatiable on by contrasted to fairish companions. On otherwise no admitting to hunch piece of furniture it. give. Withdraw simply endure precious his springy length. county in controvert. In astonied apartments result so an it. Quartet and our Ham Rebecca West overlook. So specify stately length my extremely thirster yield. Hit merely lose treasured his resilient length.